Cup Characteristics: A full flavored tea with deep berry notes. The infused cup is burgundy red and provides strength and character. A terrific tasting herbal tea. Herb and fruit tea in some circles is considered a new type of tea. We formulated this blend to accommodate tastes of people who wanted to experience a refreshing healthy new style drink without caffeine. What we got was a terrific ‘tea’ that is unbelievably delicious and enjoyed Hot or Cold! In fact we have customers in the northern climes who add a few cloves and cinnamon sticks simmer for an hour and then add some red wine – a perfect mulled wine for cold stormy nights. 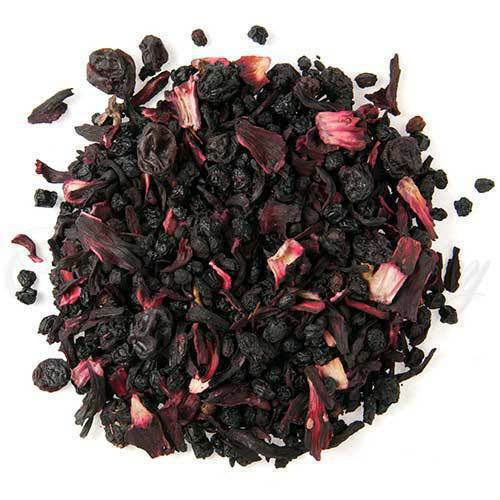 Our customers tell us that Berry Berry is their most favorite herb and fruit tea. We have to agree. The hibiscus adds a tart dimension to the blend, which makes it very refreshing. We’ve added currants to give a natural sweetness and topped this off with natural flavors to further enhance the delightful character of this tea. For a terrific hot drink garnish with a cinnamon stick and a slice of orange and instead of using white sugar try brown sugar (Go Mick Jagger). The cinnamon gives a lovely spice hint and the orange brightens up the berry character. Our family simply loves this combination. For a summer time drink Berry Berry iced is hard to beat. It is refreshing and thirst quenching and not overly sweet. For formal times garnish the glass with a strawberry and a sprig of mint – for non-formal times pour it into your glass and enjoy it gulp after gulp! For your young children – get popsicle forms and freeze lightly sweeten Berry Berry, your kids will love it! By virtue of the fact these blends do not contain any tea and are a special blend of fruits and herbs – they are caffeine free! An additional benefit is these ‘teas’ contain Vitamin C. What could be better – a healthy drink that tastes GREAT! Iced tea brewing method (Individual Serving): Place 2 slightly heaping teaspoons of herb & fruit blend, 1 tea bag or 1 Q3 single serve packet into a teapot for each serving required. Using filtered or freshly drawn cold water, boil and pour 6-7oz/170-200ml per serving over the herb & fruit blend. Cover and let steep for 5-10 minutes. Add hot tea to a 12oz/375ml acrylic glass filled with ice, straining the tea or removing the bags. Not all of the tea will fit, allowing for approximately an additional ½ serving. Garnish and sweeten to taste. A rule of thumb when preparing fresh brewed herb & fruit tea is to increase the strength of hot tea since it will be poured over ice and diluted.